Larry Schweiger, NWF President, wildlife watching in Yellowstone (photo by Beth Pratt)President & CEO of the National Wildlife Federation Larry Schweiger appealed to an audience inYellowstone National Park yesterday to take action at this important “moral moment” in the fight against climate change. Schweiger outlined the overwhelming evidence that thousands of peer reviewed scientific reports have documented on climate change, and showed startling images from around the world representing the toll global warming has already taken on this planet. He recently attended the United Nations Climate Change Conference in Copenhagen and urged attendees to put pressure on their elected representatives to pass comprehensive legislation. Larry Schweiger, President and CEO of the National Wildlife Federation (photo courtesy NWF)Since the age of fourteen, Larry Schweiger, President and CEO of the National Wildlife Federation(NWF), has been active in wildlife conservation. Over his impressive career, he has spearheaded environmental efforts through his work in non-profit and government service, and since 2004 has led the NWF, America’s largest conservation organization. Like most environmental leaders, Schweiger realizes the dire consequences that climate change presents toward life on earth, and he recently attended the United Nations Climate Change Conference in Copenhagen to urge world governments to act. His new book, Last Chance: Preserving Life on Earth, is an impassioned plea for us to combat climate change before it destroys the precious legacy of life that we leave to our children and grandchildren. All author proceeds from the book are being donated to NWF. 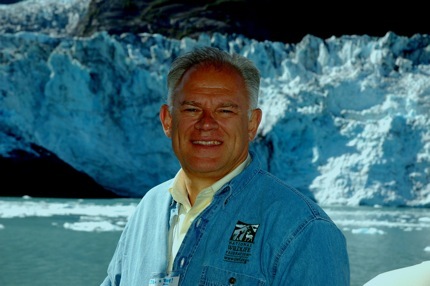 Mr. Schweiger will be speaking on climate change and signing copies of his new book in Yellowstone National Park on January 7, 2010 at 8:00 pm at the Mammoth Hot Springs Hotel. Grizzly bears in Yellowstone are threatened by climate change (photo by Beth Pratt)Grizzly bears in the Greater Yellowstone Ecosystem remain protected as the result of this week’s ruling by U.S. District Judge Donald Molloy. Two years ago the U.S. Fish and Wildlife Service wanted to remove the grizzly bear from the endangered species list. The Greater Yellowstone Coalition, a non-profit advocacy group, filed suit to block the removal. 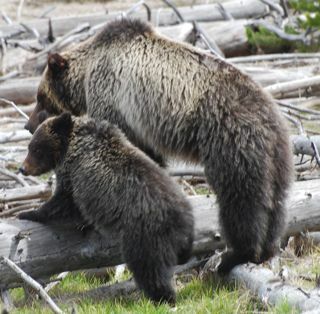 The non-profit won the case and Judge Molloy placed the grizzly bears back under federal protection in September, stating, "Without the protections of the Endangered Species Act, the Yellowstone grizzly bear distinct population segment will be placed in jeopardy." The government appealed the ruling and sent the case back for review, which was resolved with the announcement this week of the grizzly bear’s protection being upheld. In Yellowstone National Park and the surrounding area, a tiny beetle may decide the fate of the kingly grizzly bear. A beetle that destroys the whitebark pine tree has gained a considerable foothold in Yellowstone because of the effects of climate change. High in nutritional value, whitebark pine nuts provide a valuable food source for the bears. The relationship between the bear’s survival and the whitebark pine was an important part of Judge Molloy’s decision. 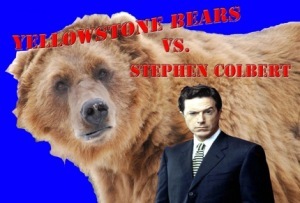 Even the popular news host Stephen Colbert has raised attention about the plight of Yellowstone’s bears—albeit humorously—with a segment on his regular feature “Threatdown.” Yellowstone’s bears have also attacked Colbert for promoting anti-ursine propaganda and fear mongering. From my home in Yellowstone National Park, I’ve watched hundreds of vehicles entering the park under the famed Roosevelt Arch, and I have taken hundreds of photographs for strangers wanting a memento of themselves standing next to its impressive rock walls. Underneath its inscription, “For the benefit and enjoyment of the people,” I have witnessed the joy, happiness, inspiration, and awe visitors from all over the world experience as they enter Yellowstone. In Yosemite, on an overlook at Glacier Point that provides incredible views of the incomparable Yosemite Valley, its roaring waterfalls, and the iconic Half Dome, I have seen people shed tears in utter happiness at the landscape before them. At Point Reyes National Seashore, I brought a group of inner-city school children on a field trip, and watched them come alive, delighted by their freedom from traffic and gray concrete, as they ran on the beach and watched whales breach in the ocean. Our national parks and wildlands furnish us with peace and inspiration, and consistently evoke joy in those who visit. The remarkable spiritual and healing capabilities of our parks cannot be understated. Indeed, these special places have provided, in the words of naturalist John Muir, something essential to our soul: “Everybody needs beauty as well as bread, places to play in and pray in where nature may heal and cheer and give strength to the body and soul.” Ken Burn’s recent documentary, "The National Parks," lovingly captured the deep connection we as a people share with the parklands, and the absolute essentialness of “America’s Best Idea” to our nation’s heritage. But imagine Glacier National Park without its namesake glaciers. Or Yellowstone without grizzly bears roaming through its forests. Or Joshua Tree bereft of its namesake feature. Losing our national parks, our national heritage, this connection to nature, to our past, to our essential selves, would be a tragedy of the highest degree. Yet as Americans, we can act now to help preserve our parks by lobbying our elected officials to take action, supporting non-profit organizations working toward park preservation, and adopting sustainable practices in our lives. On Wednesday night, Stephen Colbert launched yet another cowardly assault on grizzly bears, naming them the number one threat on his “Threatdown,” and encouraging viewers to shoot pine beetles in order to keep Yellowstone’s grizzly bears off the endangered species list. Xanterra Parks & Resorts installs solar panels in Death Valley to reduce greenhouse gas emissionsXanterra Parks & Resorts partnered with eleven other major U.S. companies and the non-profit World Wildlife Fund in sending an open letter to the U.S. Senate that urges government to take immediate action on climate change. Xanterra Parks & Resorts strongly believes that sound environmental practices translate into good business as well. Xanterra’s President and CEO, Andrew Todd, thinks “we really have no choice: businesses must learn to succeed both financially and ecologically. Otherwise, we jeopardize our irreplaceable natural resources, as well as the future generations that depend upon them.” As the company manages concession operations in National Parks across the country, including Yellowstone, Rocky Mountain, Death Valley, Crater Lake, Grand Canyon, and Zion, it takes its role as an environmental steward very seriously. In all of its locations, Xanterra has taken ambitious steps to reduce greenhouse gas emissions and reduce its environmental impacts. In 2008, it installed a solar power system in Death Valley that generates enough electricity to power more than 700 American homes per year—and it will reduce greenhouse gas emissions by 23,000 tons over its 30-year life. In Yellowstone, the company diverts72% of its solid waste from landfill disposal through an aggressive recycling program and engineered a system that allows it to burn used cooking oil to heat the historic hotels in the park. Park visitors explore the BioBlitz discovery tentThe elk herd that frequents Mammoth Hot Springs remained conspicuously absent, perhaps sensing their star status had been supplanted—at least for the day—by Yellowstone’s smaller creatures. Hundreds of Yellowstone visitors young and old gathered around the Yellowstone BioBlitz tent eagerly peering into microscopes at red water mites or watching a display of carnivorous aquatic beetles. 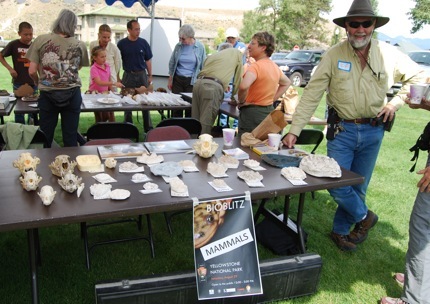 Volunteer scientists from across the country, all of whom had just spent an exhausting day counting the flora and fauna in the Mammoth Hot Springs area, enthusiastically related stories of their discoveries. Mycologist Bob Antibar, who had traveled from Ohio for the event, proudly displayed a colorful array of mushrooms at his table and cheerfully fielded questions about the strange-looking fungi. He was pleased with the results of the BioBlitz: “We did pretty well for such a dry area of the park, counting almost a hundred species of fungi.” Cathy Cripps, from Montana State University, explained her important work in using beneficial fungi to foster the health of the whitebark pine tree, which is threatened in the Greater Yellowstone Ecosystem. A Columbia spotted frog collected from the fieldIn contrast to the numbers of the fungi-enthusiasts, the herpetologists were disappointed in finding only Columbia spotted frogs and two snakes. Since only four species of amphibians and six species of reptiles live in the entire park, finding three species is still quite an accomplishment in itself. Visitors did not seem to be keeping score and delighted in viewing the live Columbia spotted frog and garter snake the herpetologists had gathered from the field. At the insect table, a microscope revealed dozens of tiny creatures wiggling among leaf litter. Beetle expert Michael Ivie proudly showed people the tiny featherwing beetle, the smallest beetle in Yellowstone and one of the smallest in the world. The size of a pinhead, the beetle had to be viewed through a hand lens. Dr. James Halfpenny with his animal track collectionDr. 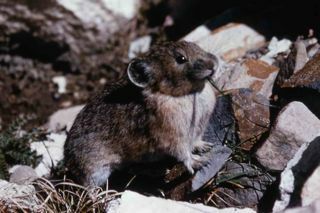 James Halfpenny, a scientist based in Yellowstone, had a full collection of mammal track casts on display and shared photographs of his group’s exciting find; while searching for pika, his team encountered a marten scurrying among the rocks. “We must have taken over 400 photos of the marten between us,” he said and laughed. Overall, a total of 956 species had been identified by noon on Saturday. 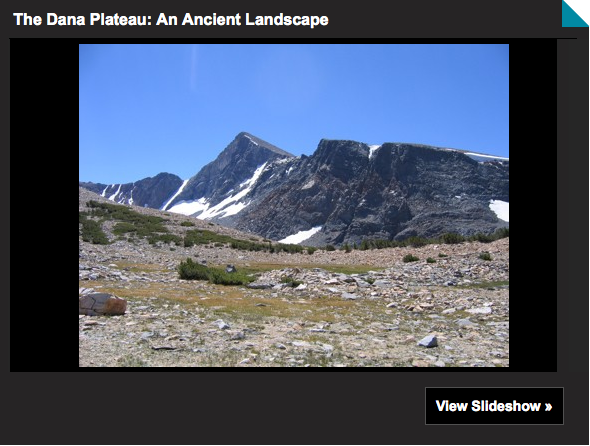 The scientists will continue to study their findings and publish the final results on the Greater Yellowstone Science Learning Center website. The first Yellowstone BioBlitz not only provides an important biological inventory, but also helps scientists understand how to maintain the health of an ecological system. With climate change, pollution and other environmental ills threatening our public lands, studies like these will be crucial to the future of Yellowstone and other national parks. Visit my Examiner page for a slideshow of the event. 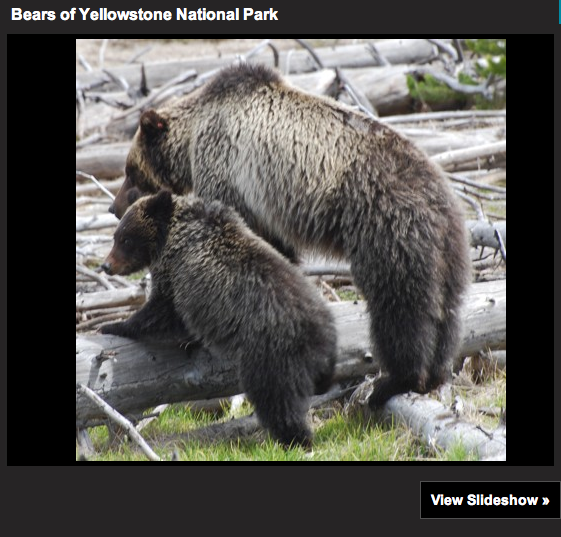 Imagine Yellowstone National Park without grizzly bears roaming through its forests. Or desert bighorn sheep missing from the landscape of Arches or Canyonlands. In Yellowstone, a tiny beetle may decide the fate of the kingly grizzly bear. Whitebark pine nuts provide a valuable food source for the bears. A beetle that destroys the whitebark pine tree has gained a considerable foothold in Yellowstone because of the effects of climate change. In some parts of the Greater Yellowstone ecosystem, beetles have destroyed up to 90 percent of the trees in whitebark pine forests. Removing this important component of the grizzly bears’ diet puts considerable stress on the species that could ultimately lead to extinction. You can view the full report on NPCA’s website. 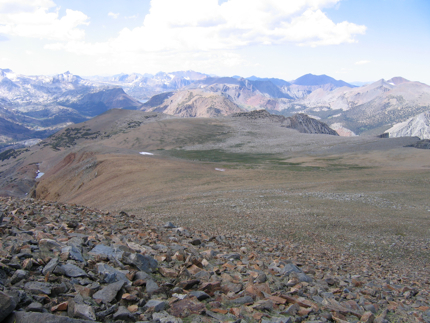 During my first thru hike on the John Muir Trail almost fifteen years ago, on the ascent up to Seldon Pass I encountered a young man energetically trotting down the trail without a backpack. Before even saying hello he asked excitedly, “have you seen any frogs?” The question was a strange greeting, but this researcher had luckily encountered a fellow frog enthusiast. 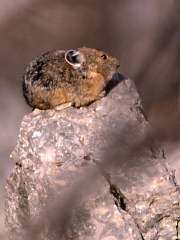 Subsequently he revealed that he was a researcher studying frog populations in the Sierra Nevada. I wish I could recall his name, but his passion for frogs I remember well. Frog and Mantis ShowdownI’m not sure when my passion for frogs began—as a child of the 70s I’m sure watching Kermit the Frog on the Muppet Show had something to do with my interest. I spent countless hours searching the banks of the Concord River in Massachusetts looking for amphibians; as an adult, I wandered the high country in Yosemite near Tioga Pass looking for the Yosemite toad. 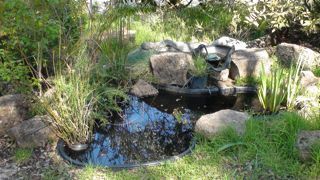 In 2007, my partner and I constructed a frog pond at our home outside Yosemite (I need to give proper credit: he constructed it while I took the easy job and decorated it with plants). Our intent was to provide a proper habitat for the Pacific Chorus frogs that already lived in our yard. 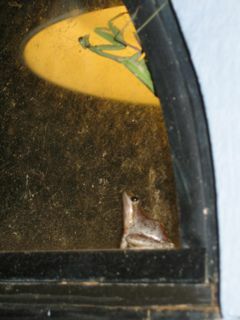 Instead of watching television on summer evenings, we would gaze at the chorus frogs catching moths on our window ledge. One memorable occasion, a chorus frog and a California mantis engaged in a standoff—neither one backed down and both eventually retreated. 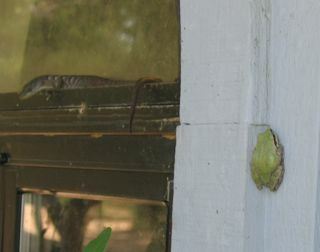 Another time an Alligator lizard and a chorus frog rested nearby each other on our windowsill. Pacific Chorus Frog Eggs in Our PondMuch to my delight I also discovered chorus frog tadpole eggs in our pond during my visit (I love the Honduras word for tadpole: “bunbulun”). The tiny eggs grew rapidly during my stay at home, from small dots to wriggling miniatures. I regretted having to return to Yellowstone before they hatched, but my partner Shad has promised to remain on tadpole watch and send photos as soon as they emerge. Below is a video of our frog sanctuary. Despite the success of our backyard frog sanctuary, I am extremely worried about our frog friends across the globe. As Kermit the Frog sang, “It’s Not Easy Being Green.” Today, amphibians worldwide are disappearing at an unprecedented rate. I’ve written previously about the staggering declines of Yellow-legged frog in Yosemite and the Sierra Nevada, and the recent study in Yellowstone that showed decreases in 3 of the 4 amphibian species in the park. If frogs are having a difficult time surviving in some of the best-protected places on the planet, something is truly wrong. Here’s another alarming statistic: climate change, pollution, habitat destruction and disease have put over a third of the world’s amphibian species on the brink of extinction. How can you help? 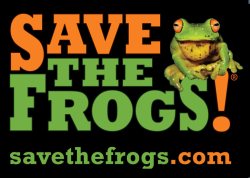 Dr. Kerry Kriger, who is currently studying amphibian disease, founded a great organization: Save the Frogs. Visit the website to learn more about amphibian extinction and what you can do to help. Be sure to also mark your calendar so you can celebrate the first official Save The Frogs Day on April 28! The National Parks Conservation Association’s (NPCA) Mike Cipra recently testified about the impacts of climate change on our national parks at a government hearing held just outside Joshua Tree National Park—an appropriate setting given global warming may eradicate the tree from its namesake park within a century. Krummholz Whitebark Pine on Mt. Washburn (NPS Library)The knarled and twisted trunk of the intrepid whitebark pine stands as a testament to the stubbornness of a tree and its will to survive in harsh conditions. 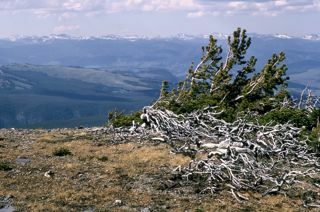 Although found at a range of elevations above 7,000 feet, the whitebark gains character the higher it lives, as strong winds and freezing temperatures stunts its growth into a “krummholz” (German for crooked or bent) formation. When I spend time in the subalpine zone, I gaze at the tops of the whitebark pine looking for my favorite bird, the boisterous Clark’s Nutcracker, who plays an important role in the dispersal of the tree’s cones and seeds, and consequently its regeneration. (I have the utmost respect for the Clark’s Nutcracker, who can store over 30,000 seeds in thousands of caches and remember every location!) Watch a video of the bird extracting seeds on the Whitebark Pine Ecosystem Foundation website. Whitebark Pine Seeds: A Grizzly Bear's Favorite Food!The nutrient-rich seeds of the whitebark pine support a diverse array of wildlife, from nuthatches and finches, to chipmunks and squirrels. 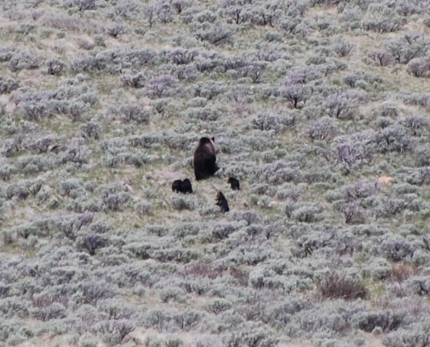 Yet the seeds also provide one of Yellowstone’s largest mammals—the grizzly bear—with a vital component of its diet. Grizzly bears usually don’t pluck cones from the tree, but raid the middens of hardworking squirrels for the majority of their seed consumption. 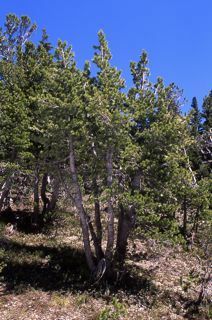 Although the lodgepole pine is the most common tree in Yellowstone, the whitebark pine may rank as the most important to the park’s ecosystem. The tree acts as a keystone species—a species that exerts significant influence on the ecological community it inhabits, and as a result, its demise can have catastrophic consequences. Whitebark Pine in Yellowstone (NPS Library)Unfortunately, those consequences might already be occurring as the whitebark pine is suffering from several ailments—some of which are enhanced by climate change. The mountain pine beetle and the blister rust fungus have begun to gain a foothold, perhaps due to changing climatic conditions. An increase in the frequency of severe fires, also thought by some to be the result of global warming, creates conditions unfavorable for the tree. In early December, the Natural Resources Defense Council petitioned the federal government to list the whitebark pine on the endangered species list. The non-profit group cited some alarming statistics: in portions of the whitebark’s range, 50% of the trees are dead and 80 to 100% of the live trees are infected with blister rust or beetles. Below is an excellent video by the NRDC on the threatened status of the whitebark pine. How can you help? Support the important work of organizations like the NRDC and The Whitebark Pine Ecosystem Foundation. For more information on the whitebark pine, you can also visit an overview at the Greater Yellowstone Science Center. Stinson BeachAccording to the Natural Resources Defense Council’s “Losing Ground” report, climate change will have significant consequences on California’s coast. Several public agencies and other conservation designations help protect a large portion of California’s 840-mile scenic coastline. Yet rising sea levels resulting from global warming threaten to erode beaches, ravage the delicate balance of estuaries and wetlands, and destroy cultural resources and recreational areas. Point Reyes National Seashore may lose many of its estuaries; Golden Gate Recreation Area, with 59 miles of beaches, faces severe coastal flooding; and, over half of Channel Islands’ seashore has been deemed very vulnerable to rising tides. The report specifically names a number of beaches in Northern California, and I decided to explore these special places during my recent trip to the Bay Area. My partner on my field trip, the naturalist Jack Laws, has been exploring the California coast since childhood and made for an enthusiastic and knowledgeable tour guide. Red-tailed Hawk at Sunset, Point Reyes National SeashoreIn one day we managed to visit most of the beaches listed in the report, and our determination was rewarded with a trip filled with wondrous sights: from viewing ochre starfish on a rock exposed by low tide at China Beach, to observing Tule elk resting under a full moon in Point Reyes National Seashore, to gazing at harbor seals lounging in Bolinas Lagoon. These magnificent places boast spectacular scenery, provide homes for diverse and numerous populations of flora and fauna, and offer recreational opportunities for people throughout the golden state. I agree with Jack, however, when he expressed his affinity for the California coast as originating from “the feeling it evoked of freedom, possibilities, and liberation in its limitless space.” For all these reasons, we simply must take action to preserve these areas before it’s too late. Below are highlights of our field trip along with a video diary. More photos are available in my gallery. Ocean Beach, Golden Gate Recreation Area (GGNRA): The famous Cliff House overlooks Ocean Beach; its close proximity to San Francisco makes it a popular destination for city dwellers. Even with the dense fog and cool temperatures, surfers braved the waters and beachgoers tossed frisbees. Jack discovered a red nereid worm in the sand and revived some jellyfish stranded on the low tide. Cliff House Overlooking Ocean BeachChina Beach, GGNRA: Named for the Chinese fisherman who camped in the sheltered cove, China Beach offers a nice picnic spot, but the swimming can be dangerous. The low tide during our visit revealed two ochre starfish clinging to a rock as they dined on mussels, and a lively gathering of seagulls on the shore included an assortment of heermann’s, mew, ring-billed, and glaucous-winged gulls. Other creatures making an appearance: a willet, shore crab, limpets, and a double-breasted cormorant. Golden Gate Bridge from Baker BeachBaker Beach, GGNRA: The Golden Gate Bridge, peaking out of the fog, greeted us as we entered. On the dunes of Baker Beach yellow-sand verbena and beach strawberry bloomed in bright yellow and white—a stark contrast to the dull brown sand. Muir Beach, GGNRA: The path to the beach leads through a brackish lagoon and we scanned the landscape for the various shorebirds that linger here. Fog hovered over the coastline, reminding me of Carl Sandburg’s famous poem: “The fog comes on little cat feet./It sits looking/over harbor and city/on silent haunches/and then moves on.” Jack told me about witnessing the spectacular salmon run on Muir Beach, while I pretended the sun was shining and waded in the water. Stinson Beach, GGNRA: The sun strained to conquer the fog and almost succeeded, yet the marriage of light and dark painted the shore in a misty mother-of-pearl iridescence. A small willet chased a long-billed marble godwit, trying to steal his foraged food, while seagulls hosted a noisy gathering nearby. Sharks have been known to frequent the waters off Stinson beach; Jack and I searched for the telltale fin cutting through the water with no success. Drakes Estero: Point Reyes National Seashore (PRNS): Drake’s Estero is a picturesque spot in Point Reyes National Seashore with its waters meandering gently inland; from above the waterways resemble an outstreched hand. Once a drowned river valley, the marshlands, tidal flats, seagrass beds, and intertidal areas—along with the diverse plants and animals it supports—has been recognized as one of California’s most ecologically pristine estuaries. Point Reyes Beach, PRNS: The powerful surf and unyielding wind has shaped the character of Point Reyes beach—truly we felt like we were standing on the edge of the world. Also known as Giant Beach, the shoreline stretches undisturbed for ten miles and the water arrives unencumbered from the mighty expanse of the Pacific. Utilizing some bull kelp that had been washed ashore, Jack quickly constructed a kelp horn, although his music could hardly be heard above the roar of the wind. Full Moon Over Drakes BeachDrakes Beach, PRNS: Did Sir Francis Drake land at his namesake beach? There is some debate whether the sandstone cliffs along this beach refer to the white cliffs mentioned in Drake’s journal. We arrived at sunset and the pinkish hues reflected on the water while the full moon danced both in the sky and on the beach. And as if nature had cued up a delightful cast of characters for our last site, during our drive to and from Drake’s Beach we saw Tule elk resting in a meadow under a full moon, a red-tailed hawk perched on a fence post at sunset, and just before dark a great-horned owl soared past our car. For information on the areas we toured, you can visit the National Park Service’s website on the Golden Gate National Recreation Area and Point Reyes National Seashore. The Golden Gate Conservancy and the Point Reyes National Seashore Association’s websites also contain excellent visitor information. Chorus Frog Crawling on Author's HomeWhen I relocated from Yosemite to Yellowstone, I had to adjust to subzero temperatures, a lack of Thai food, and being in the middle of the food chain. Yet the most difficult alteration involved the shortage of my favorite animals: frogs. In my home outside of Yosemite, the delicate pacific chorus frogs decorated my windows as they prowled for moths, and on my hikes in the Sierra I often encountered the mountain yellow-legged frog lounging around sunny stream banks. As I reported in a prior entry, Yosemite’s amphibians have declined alarmingly in recent years—some populations of the mountain yellow-legged have been reduced by over 90 percent in the Sierra Nevada. 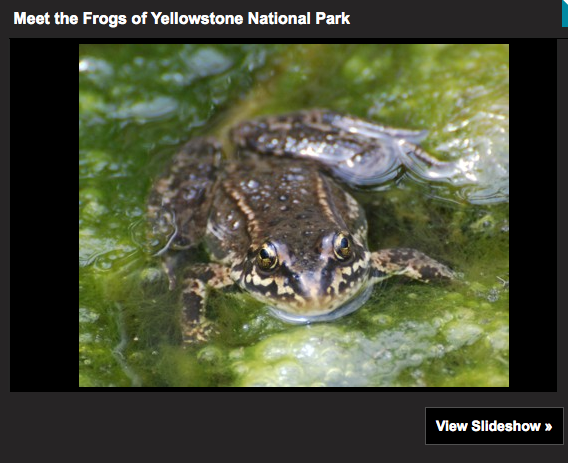 Columbia Spotted Frog (NPS Library)Authors Sarah McMenamin, Elizabeth Hadly, and Christopher Wright surveyed kettle ponds (ponds originally formed when glaciers retreated and fed by snowmelt and groundwater) between 2006 and 2008 in Yellowstone's Lamar Valley. They discovered that dry ponds have increased 4-fold in the past sixteen years, and as a result eliminated a large segment of ideal amphibian habitat in the park. Even more troubling, the study found that three of the four amphibian species in Yellowstone had experienced sharp declines in their populations.